Sven is a Nord lumberjack living in the town of Riverwood. He is a graduate from the Bards College and makes a living playing music at the Sleeping Giant Inn. He is involved in a love triangle with Faendal and Camilla Valerius. Sven shares a house with his mother Hilde in the western part of Riverwood. He sleeps there every night between 2am and 9am and always starts the day with a one-hour breakfast, relaxing behind locked doors. At 10am he heads down to the Sleeping Giant Inn where he puts his education from the Bards College to good use, singing, playing, and taking requests for a whopping sixteen hours, before he heads back to the house and goes to bed. He wears a simple set of farm clothes with a pair of boots. He wields an iron dagger and carries his house key and a selection of common loot and gold. Hilde: "A dragon! I saw a dragon!" Sven: "What? What is it now, mother?" Hilde: "It was as big as the mountain, and black as night. It flew right over the barrow." Sven: "Dragons, now, is it? Please, mother. If you keep on like this everyone in town will think you're crazy. And I've got better things to do than listen to more of your fantasies." Hilde: "You'll see! It was a dragon! It'll kill us all and then you'll believe me!" When talked to, Sven will immediately tell you: "Faendal thinks he can woo Camilla Valerius away from me. She's already mine, I keep telling him." He will then move on to a set of regular greetings: "You look like a traveler. Someone that has seen far away places and heard new stories. ", "You should come hear me play at the Sleeping Giant Inn. For a small sum you can even pick the song. ", "I've been trained as a skald, as was my father, and my father's father before him." and "My time at the Bards College was brief. A prodigy has little need for formal education." The rest of his greetings see him return to his problem: "I'm composing a new song. A ballad, for Camilla Valerius." and "Some day Camilla will know of my affections. Some day..." If you tell him about the dragon in Helgen he will put his own problems aside for a minute: "Truly? So maybe my mother isn't crazy after all. You had best tell the Jarl in Whiterun. He needs to know about this." He will also recommend a few places in Riverwood: "Lucan's got a little bit of everything at the Riverwood Trader. If you need weapons or armor, see Alvor, the blacksmith." If you talk to him while he is at the inn, he will also readily tell you about his days at the Bards College: "At the Bards College in Solitude. They train bards and skalds like myself. If you go there, talk to Viarmo. He's the headmaster." "Oh, Sven. You do know how to turn a girl's head." Camilla: "You play so well." Sven: "With you as my muse, how could I not?" Camilla: "Oh, Sven. You do know how to turn a girl's head." Faendal: "Stay away from Camilla." Sven: "Ah, Camilla. Fair as the morning sun. But I ask you, how could she prefer your brooding to my romantic tunes?" Faendal: "Just stay away from her, or...or else." He sounds persistent. Why not do something about it? "You may be right. Camilla may see Faendal as little more than a friend, but why take chances? Here. Give Camilla this letter. It's full of venomous nonsense. Tell her it's from Faendal." Yes. Two people spending time together never blossoms into courtship. "Is that sarcasm? I've heard better wisecracks from Orgnar. Still, you have a point. Camilla letting Faendal visit her isn't a good thing for me. Here, let me give you a particularly venomous letter. Say it's from Faendal. That should get Camilla to stop inviting the elf over." 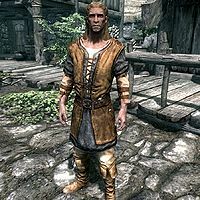 Regardless of your choice, he will hand you a fake letter and Sven will remind you: "That letter ought to convince Camilla to never speak to Faendal ever again." You can also show it to Faendal, who will write another fake letter to make Sven look chauvinist. If you show that letter to Sven, he will be quite surprised: "What is this? The elf playing at treachery? Shocking. As if I would write this dribble. How about we play a bit of turnabout with Faendal? Here. I had to use simple words, but this letter should convince Camilla it's from him." If you end the quest in Sven's favor, he will say: "Now that's what I like to hear. Good work. I think you deserve some gold from my tips at the inn." He will then hand you a leveled amount of gold. Additionally he will now be available as a follower. Sven is the only Bard follower. He is also the only follower with a morality that is not either 0 or 3. Sven will occasionally perform the inn music made famous by Arena and Daggerfall, albeit in a more melodious key than its predecessors. Sven was supposed to have yet another dialogue option, "Do you know any old ballads about dragons?" However, the option never shows up, so Sven's response will never be heard in-game: "There's the one about Tiber Septim and the dragon Nafaalilargus. I never bothered to learn it. The Blades killed them all centuries ago. Nobody asks to hear that lay anymore." When told to wait, Sven will sometimes play his flute. Sven is tied with Roggi Knot-Beard for the lowest level cap among all permanent, non-creature followers. According to game data, he was originally going to be named Raevild. With Dragonborn installed, Sven's voice may use incorrect dialogue from the add-on, though the subtitles will display his correct follower dialogue. If you later take him as a follower and recruit him into the Blades, he will sometimes continue to play his flute during the sequence where is he supposed to be declaring his oath to the creed of the Blades. He may also play his flute without any instrument being visible. And he may go back to Riverwood as a Blade instead of staying in Sky Haven Temple. ? If you get involved in the love triangle, much later in the game he may start a fight with his rival which will result in him being killed by the guards. ? Sven's AI may get stuck and he'll keep walking back and forth down Riverwood's main road, so he will never play at the Sleeping Giant Inn. ? To fix this, first select Sven in the console. Follow the road west of the village until it curves, and then head south. Type moveto player in the console. This will teleport Sven to your location. Walk away from him and he will start walking back, but should end up taking a long path around the south side of the village. This should fix his AI. This glitch can also simply be fixed by completing the love triangle quest in favor of Sven, thus allowing you to make Sven a follower. After making Sven a follower, follow the road west of Riverwood until it curves, then head south. Finally, tell Sven that it's time to part ways and then wait an hour or two. Sven should then reappear in Riverwood with his AI functioning normally, allowing you to listen to his songs in the Sleeping Giant Inn. This page was last modified on 21 July 2017, at 23:10.